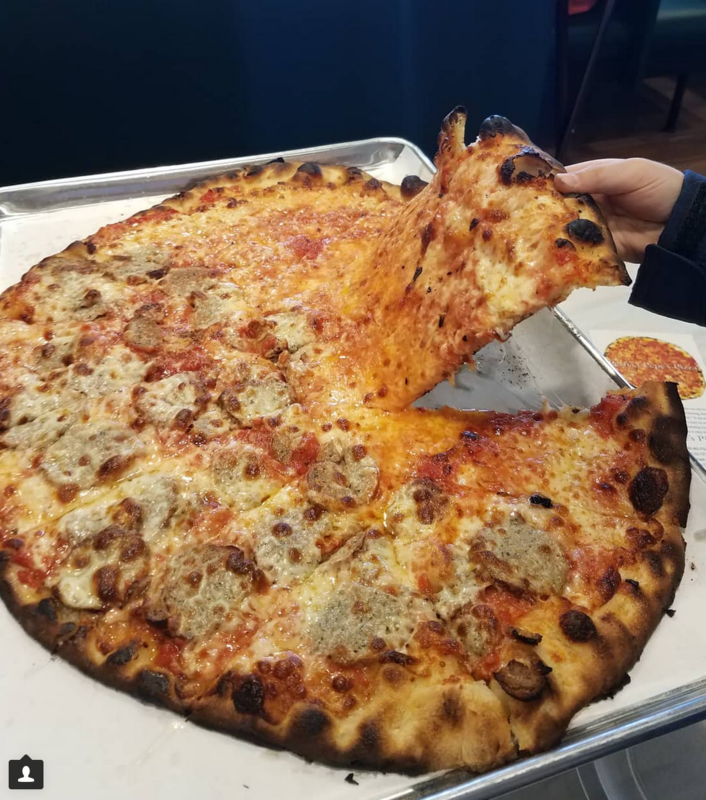 The famous New Haven brick oven pizza shop opened its tenth location on Monday in Warwick, Rhode Island. Half tomato pie with mozzarella and meatball pizza at Frank Pepe’s in Warwick. Frank Pepe’s Pizza has arrived in Rhode Island. This past Monday, the grandson of Frank Pepe, and current co-owner of Frank Pepe Pizzeria Napoletana‘s family-owned businesses, Gary Bimonte, welcomed press to the official opening of its tenth location. Two weeks before the opening, media was also invited to the official lighting of the oven, which I attended. Before us stood the 100,000-pound, coal-fired brick oven, which was lit with a crumpled-up paper bag from Whole Foods and hardwood to spark the flame. The 600-degree oven will go through a ton of coal a week, as does each Pepe’s location. The coal is responsible for the pizza’s crisp but slightly charred, airy crust. The oven itself is a recreation of the original masterpiece in the New Haven location. It has the same white subway tile and antique-looking cast iron embellishments as the first, except it’s a replica made with modern materials. Mark Turcio and Gary Bimonte at the blessing of the oven at Frank Pepe’s Pizza in Warwick. Along with the official lighting, the ovens are also blessed with holy water. 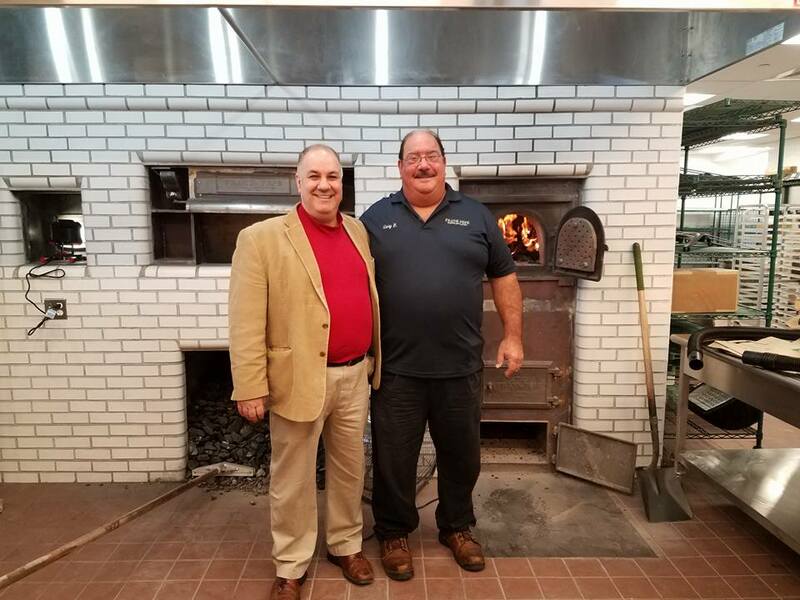 Pastor Mark Turcio from the Goshen Hill Church in Lebanon, Connecticut, has been on hand for the blessings of all of the ovens at the locations, except one. He grew up going to Frank Pepe’s in New Haven as a kid when he used to sneak out of school for lunch to go see his Uncle Joe who worked there. He would have an anchovy and olive oil pizza for lunch and return to school with sauce on his shirt as evidence. Rhode Islanders are looking forward to visiting the first Pepe’s Pizza in the state. Some people camped out the night before the official opening, as the first ten guests in line received a $100 gift card. Now the white pizza with freshly shucked clams, grated cheese, olive oil, fresh garlic and oregano is one of the most famous varieties of Pepe’s Pizza. The original tomato pie is also a must. The brick oven at Pepe's Pizza. Photos by Samantha Labrecque. The coal-fired oven at Pepe's Pizza. Gary Bimonte lights the oven. Pastor Mark Turcio blesses the Pepe's Pizza oven. Mark Turcio and Gary Bimonte at the oven lighting. Mark Turcio blesses the oven.